We bill you monthly according to that month's use of Fastly's services. We measure months according to Coordinated Universal Time (UTC). For usage-based charges, bandwidth is recorded in bytes and presented in gigabytes (GB), and requests are recorded individually and presented in units of 10,000. Fastly uses The International System of Units (SI Units) to measure bandwidth. In our calculations, 1 gigabyte (GB) = 109 (1,000,000,000) bytes, 1 terabyte (TB) = 1012 bytes (or 1,000 GB), and 1 petabyte (PB) = 1015 bytes (or 1,000 TB). Your invoice shows your usage and that matches the usage shown on the Stats page. We charge for egress traffic from our POPs, including traffic served to end users and, if shielding is enabled, traffic served from the shield POP to other POPs. Specifically, we charge for each response and for the size of the response (which includes the header and body). Each response is billed as a single request, and the response size in bytes is billed as bandwidth. We charge for bandwidth and requests for content delivered to clients from the CDN and for bandwidth for traffic sent from the CDN to our customers' origins. NOTE: If you're using Anycast IP addresses, these IPs use our global network and will route a request to the nearest POP located in a billing region that may charge a higher rate. Our billing regions can be found on the Fastly Pricing page. We announce new billing regions regularly via our network status page. Two specific settings related to responses may affect the total charges on your bill. Enabling gzipping can reduce the size of responses which reduces the bandwidth you use and thus can reduce your total bill. Enabling shielding may initially result in greater bandwidth use because requests may need to travel between POPs. The reduced load on your origin servers, however, frequently offsets this increased cost and the potential increase in your bill's total. Charges for any options you've chosen are applied in addition to the bandwidth and request usage we charge for normal content delivery and streaming. We bill a minimum of $50 per month so we can fully support all of our customers. This is the minimum price you'll pay in any month once you've completed your testing trials. For example, say that you're done testing Fastly's services and you've begun to push production-level traffic through Fastly. If most of your site's traffic for the current month is in North America and Europe and your site uses 10GB of traffic over 10 million requests, the combined bandwidth and request charges would be $8.70 for the month. Because this amount falls below the $50 monthly minimum, we would charge you $50 for that month, not $8.70. 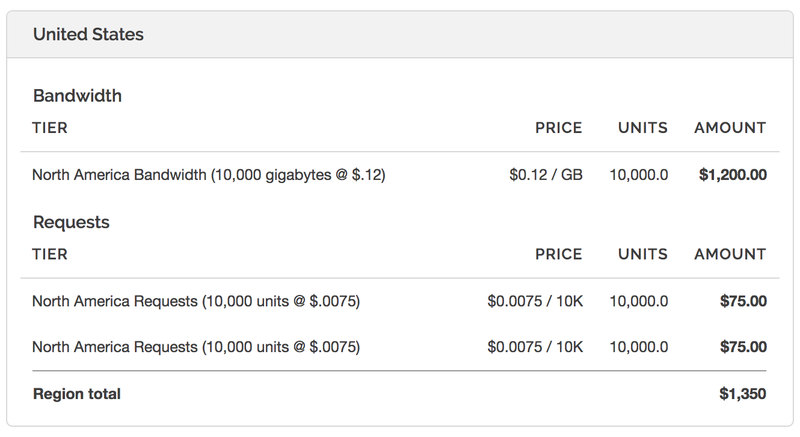 Bandwidth and request prices for some billing regions are slightly higher. If most of your site's traffic were in these other regions instead, then at the above traffic levels your bandwidth and request usage charges would still fall below the monthly minimum and we would charge you $50 for that month. NOTE: If you're using Fastly for content delivery via Heroku's cloud development services, see Fastly's Heroku add-ons pricing plan for additional details. Fastly bills in arrears, not in advance, meaning that we bill you for services after you've used them, not before. For example, if you sign up for and start using Fastly services in January, the bill you receive in February reflects January's charges and services, your March bill reflects February's charges services, and so forth. If you ever cancel your account, you'll be billed for any outstanding charges accrued through the day you canceled, or at least the monthly minimum, whichever amount is greater. If you've been assigned a superuser or billing role, you can review your account use and the associated charges via the Billing page in the Fastly web interface. 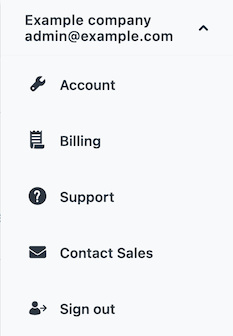 Access billing information by selecting Billing from the user menu at the top right of any page. By default, the current balance for your account appears, followed by the invoice history. Clicking on the linked date of any invoice displays a summary of charges for that month. The billing invoice summary includes the overall bandwidth you used and the associated charges, followed by the charges you incurred for requests. The bottom of the summary displays the grand total dollar amount owed for the dated month. Below the month's summary on the invoice, we include regional bandwidth and request details. The bottom of each regional details section includes the total charge for bandwidth and requests for that region alone for the dated month. TIP: A breakdown of billing charges per service is not available at this time. Our historical stats API, however, provides data on unrated request and bandwidth used by a service, aggregated by billing region. You can print account use details for any month by finding that month in the invoice history and clicking Print in the Actions column for that month. As part of our API, a billing endpoint exists to generate a report of your usage for the current partial month (known as month-to-date, or MTD). Full details of this endpoint's output format can be found in our Billing API documentation. Generating a report via API usually takes only a few seconds, but can potentially take up to 60 seconds. During this time, the API call will return a HTTP 202 Accepted response. "status" : "Pending: waiting for another process"